This little taco shop located in the heart of New Paltz on Main Street grabbed my attention with the catchy slogan "Fresh Fast Food. No Freezers, No Fryers, No Cans". Stopping in for an afternoon snack, my sister ordered a grilled steak taco and my mom and I settled for the traditional chicken taco. I stood at the counter watching the son of the owner (who'd attended culinary school) expertly grill juicy strips of steak and chicken. Next to the meat the BLUE corn tortillas were warming (the nomenclature of Mexi-Cali Blue thus revealed). Beyond the delicious taco, the real treat of Mexi-Cali Blue is the assortment of hot sauces available. Opt for the traditional Frank's Red Hot hot sauce, or venture into the world of mango, apricot and lime, jalepeno and black pepper, or even blackberry infused hot sauce to spice things up a little. Great people, great food. I will definitely return. While traveling with my mother and sister in New Paltz, New York, I came across multiple venues that sold tacos. As a lover of all Mexican cuisine and a self-appointed taco connoisseur I felt it was my obligation to try the tacos at these new-found places. 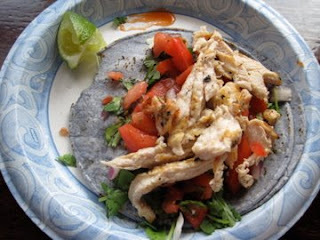 While feasting upon a delicious soft-corn tortilla chicken taco I decided to devote one of my (many) blogs to TACOS. So, now this blog, conveniently re-named BLOCHO's TACOS, will conveniently review my journey from taco to taco. Blogspot. Tumblr. WordPress. Twitter. Facebook. LinkedIn.